The Discovery of an Esoteric Message in Pascal’s Triangle. 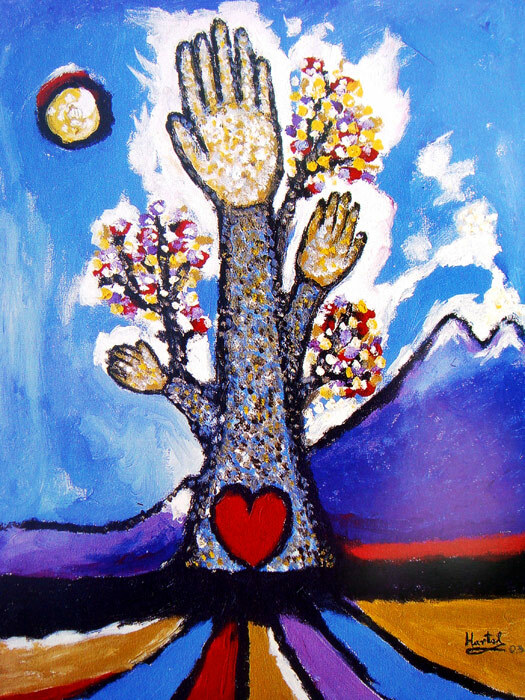 I began to experiment with Kabala inspired paintings in the 1990s. To my utter astonishment these experiments led to a totally unexpected and most exciting discovery of a transcendent communication. In the Hebrew alphabet each letter assigns a numerical value. When I substituted the numbers in Pascal’s triangle with Hebrew characters, to my absolute amazement a meaningful cluster of mystical words emerged that includes the Divine Name, the Tetragrammaton. And from the mathematical pattern in English translation this stunning message rises: One Supreme Father, Who exists, existed and will exist: Jehovah (YHVH). Fig. 1: 'The Kabalistic Message of Pascal’s Triangle'. Acrylic on canvas, 16'x20', 2010. Pascal’s Triangle is a geometric arrangement of integers that form a triangle. With one at the apex, each number in the triangular array is the sum of the two numbers above it in the preceding row. This triangular pattern of numbers progresses through an infinite series of rows of binomial coefficients. It has a variety of mathematical applications, such as calculating combinations in probability and raising the coefficients of the binomial (sum of a + b) to a specific power in algebra. The arithmetic triangle displays a bunch of intriguing properties. For example, the horizontal rows add to powers of 2 (1, 2, 4, 8, 16, etc. ), and they also represent powers of 11 (1, 11, 121, 1331, etc.). An additional feature of the array concerns the Fibonacci numbers that are embedded in it along its diagonal segments. Named after the Italian mathematician Leonardo Fibonacci (c. 1170-1250), each integer in this set is the sum of the previous two: 0, 1, 1, 2, 3, 5, 8, 13, 21, etc. The sequence tends to a particular aesthetic proportion called the Golden Section (0.61803), a ration common in art, anatomy and nature. Pascal’s Triangle can be used to figure out the possible outcomes in the popular game of coin-tossing. There are four possible variations in getting heads or tails by the random tossing of two coins: HH, HT, TH, TT. The odds of three coins to land on either heads or tails are exhausted in eight achievable chances: HHH, HHT, HTH, THH, HTT, THT, TTH, TTT. And in the case of tossing four coins the number of head or tail combinations totals 16. So, in accordance with the number of coins used in the game, the sum total of possible results appears in each row of the triangle. The French mathematician and mystic Blaise Pascal was born in 1623 and died before his fortieth birthday. He was not yet twenty when he invented a computing machine. The author of Pensées sur la religion and of Jewish origin, Pascal underwent a religious experience in his early thirties, became a Jansenist and defended his faith against the Jesuits. Throughout his life Pascal sought for signs from the Heavens, of Divine revelations. It is rather ironic that he discovered an esoteric pattern without being aware of its religious meaning. Pascal described the properties of the geometric arrangement of numbers named after him in the Traité de Triangle Arithmétique, a work published posthumously in 1665. He collaborated with Pierre de Fermat in studying the properties of the arithmetic cluster in relation to the theory of probability. However, Pascal was not the first to probe the specificities of this triangular arrangement of integers. The earliest depictions of a triangle of binomial coefficients date back to ancient Sanskrit texts, attributing it to Pingala, an elusive Indian scholar who lived more than two millennia ago and whose life is shrouded in the mist of history. Other early students of the triangle include the Chinese mathematicians Jia Xian (1010-1070) and Yang Hui (1238-1298). They both lived during the reign of the Song Dynasty. It seems that their main interest in the triangle focused on its use as a tool to find the square and cubic roots of numbers. Fig. 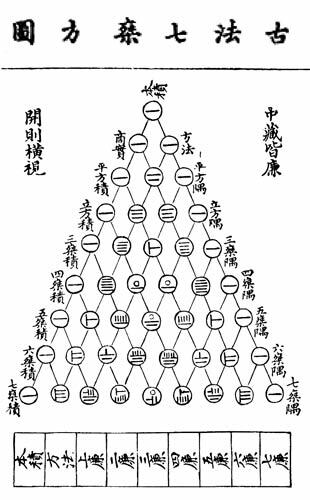 3: Yang Hui in the 13th century in China used rod numerals in the construction of an arithmetic triangle, which is similar to Pascal's. In Mathematics and Western Culture (1953), Morris Kline notes that in spite of his intensely religious nature, Pascal ended up in applying the theory of probability to God. He had been tormented by his conflict of faith because, as he wrote, ‘I look on all sides and I find everywhere nothing but obscurity. Nature offers nothing, which is not a subject of doubt and disquietude’. He searched desperately for signs of the Creator but seeing too little confidently to affirm, he ended up being in a pitiable state. And nevertheless, it was Pascal who advised to trust our emotions and intuitions. Could it be that the man who declared that ‘the heart has its reasons that reason does not know’ overlooked the signs incorporated within his own mathematical investigations? I wonder what would have been his reaction if he had seen my painting. Fig. 4: 'Math and Kabala'. Acrylic on canvas, 22'x28', 1998. 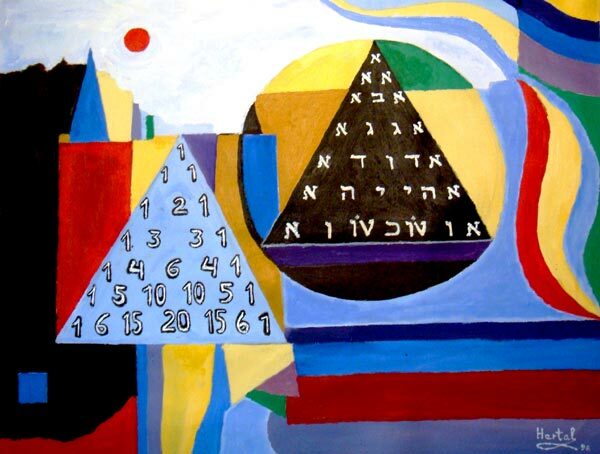 This painting, the first rendition of an esoteric Hebrew equivalent of Pascal’s Triangle, was exhibited in 1999 at the Aleph Gallery in Montreal. Here, in the seventh row the number 15 in Hebrew characters is written as tet (9) and vav (6), because Jewish tradition avoids the juxtaposition of yod (10) and heh (5), the abbreviation of God’s Holy Name. 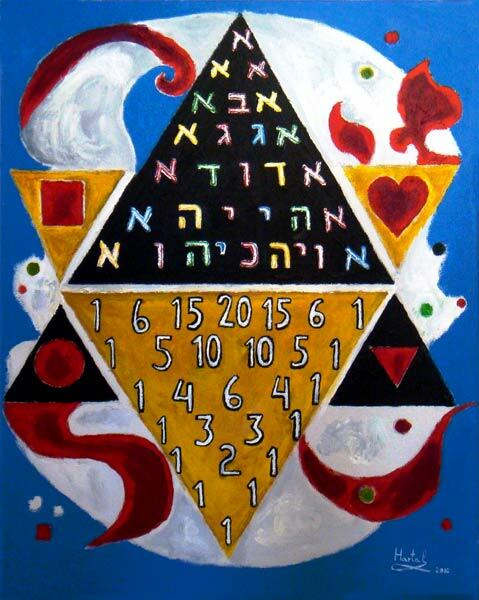 I painted the first Kabalistic version of Pascal’s Triangle in the winter of 1998. In the early days of January it occurred to me that mathematical patterns could be used for Kabalistic meditation. The triangle may symbolize many things. In alchemy it could represent fire, passion, sexuality, harmony and intellect. It is also a shape of religious significance, related to the idea of the Trinity. And combining two triangles creates the Star of David. This geometric figure also appears in meditative objects and art in Judeo-Christianity, Hinduism and Buddhism. For the psychoanalyst Carl Jung, the triangle may function as a Mandala, a representation of the unconscious self of the human psyche. The Hebrew word קַבָּלָה‎ (Kabala) means tradition or acceptance. As a mystical theosophy it holds that the gap between the unknowable infinity of God and our finite world can be bridged by means of the dynamic flow of divine emanations, or סְפִירוֹת (sephirot) that mediate between the spiritual realm and the physical universe. Such celestial emanations as חוכמה (hochmah), wisdom, בינה (binah), understanding, חסד (hesed), compassion and גבורה (gvurah), judgment and courage, reveal the divine attributes of the Creator through parallelism that exists on the human level. The cosmos is a world within worlds. Like in a hologram, the part contains the whole. According to the Kabala, God created the world ex nihilo. Thus existence came out from nothingness. Before the world was brought into being, the letters of the alphabet were created as primal spiritual forces, the raw material and the protoplasm of genesis. However, from the beginning the universe was created comprehensively, accomplished as a whole and complete to function in every part. This does not mean though that the world is in a perfect state today but that perfection is built into the fabric of existence as a quality of infinite potential. A fundamental teaching of Judaism concerns the concept of תיקון (tikun), the need to repair the world and redeem it. This transcends the realm of personal and collective responsibilities in regard to the human condition. Repairing the world involves good will and justice, peace and harmony, kindness and love. Now let us have a look at the Hebrew alphabet, which comprises 22 basic letters. They read from right to left. Fig. 6: The 22 Letters of the Hebrew Alphabet (in addition there are five different forms that are used at the end of a word). In creating a Kabalistic Pascal’s Triangle I was curious to find out what happens when the numerical entries are replaced by Hebrew characters. This was not a particularly difficult task because each Hebrew letter is endowed with a numerical value. The first letter of the alphabet, א aleph, is one, the second, ב bet, is two and the third, ג gimel, is three. And so it continues to the tenth character, י yod, which stands for number ten. By combining yod and aleph י א you get eleven, and then yod with bet י ב you have twelve, and so forth. But after nineteen, which is י ט yod-tet, the eleventh letter, כ kaf, becomes the symbol of twenty. And then the next letter, ל lamed, the twelfth alphabetical sign, represents thirty (Fig. 6). Fig. 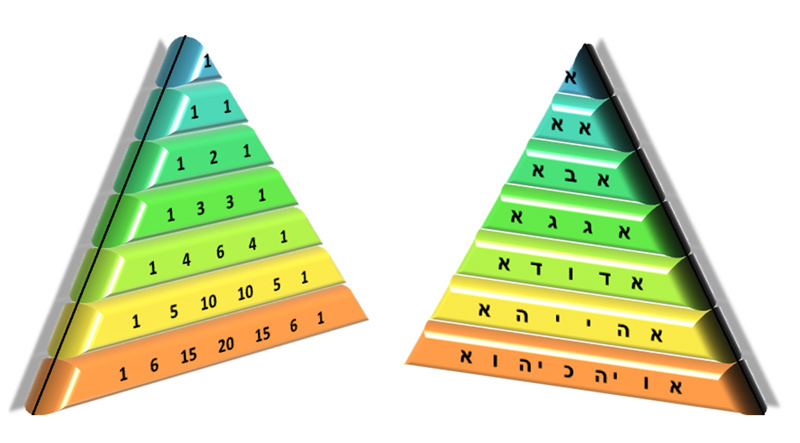 7: Pascal's Triangle and the Hebrew letters version. If you look at the painting above (Fig. 1) you can see in the right side of the image next to the sixth row of the Hebrew letters a red heart, a symbol of love and compassion. Adding the numbers in the sixth row of Pascal’s Triangle equals 32, which in Hebrew letter-numerals is lamed-bet, or לב (lev), the Hebrew word for heart. The colorful Hebrew letters displayed on the black triangle of the painting (Fig. 1) represent the corresponding numerical equivalents of the integers in Pascal’s Triangle (Fig. 7). The aleph, number one, is present in every row of the configuration. In the third row a ב (bet) appears, which has the numerical value of two. A combined א (aleph) and ב (bet) yields the Hebrew word א ב (av), which means Father. In Fig. 8 you can see that this bet sits between two alephs in the row and together they constitute the word אבא (aba), which also means father (and serves as the root of the English term abbot, too). Pascal’s Triangle is a captivating arithmetic pattern of palindromes, symmetrical constructs that read the same backwards as forwards. In the fourth row double ג (gimel) characters produce the word גג (gag) that offers the connotations of roof, top and supreme. In the sixth row we can read the words היה (haya) and יהא (yehe, or yihye), which mean he was and will be, respectively. In the seventh row the letters read כי הוא (ki hu), he who, and יהוה (Jehovah, YHVH, Fig. 8). Interestingly, in the sixth row the word הייה (haya) appears written in double Yods, in full spelling, or ktiv male. Unlike Biblical Hebrew, which writes without vowel pointers, Modern Hebrew doubles consonantal Vavs and Yods in the middle of words to avoid confusion. In specialized texts, such as dictionaries and poetry, vowel pointers called ניקוד (nikud) are used to aid the reader. The Torah is written in ktiv haser, without nikud. The sacred Tetragrammaton of God’s name, יהוה (YHVH), appears in the Hebrew Bible (Old Testament) nearly 7000 times. However, for fear of blaspheming about 24 centuries ago Jews reading the Bible substituted the word for Lord (אדוני, pronounced Adonai). Fig. 8: Left: the Hebrew words in red translate, 'One Supreme, Beloved Father: Jehovah'. Right: The word 'gdud' connotes military force, or battalion, a reference to God's Mightiness as the Lord of Armies. Objection to my interpretation of the Hebrew text in the painting of the Kabalistic Pascal’s Triangle can come on the ground that the seventh row (Fig. 8 ) misspells the Tetragrammaton: The last character in it is an א (aleph), instead of the letter ה (heh). This is a minor typographical problem, which could be compared to spelling an English word with the letter I, instead of Y. But perhaps we should not worry too much about God misspelling his own name. And now more seriously, we have to bear in mind that the Hebrew text in the painting is a mathematical configuration. And similarly to arithmetic – where we are allowed to calculate horizontally, vertically or diagonally — within the context of the painting we can do the same. When we do not limit ourselves exclusively to horizontal reading but move from one row to another, the problem disappears (Fig. 8). Accordingly, using the sixth and seventh rows as a communal reading field these words unfold: כי הוא היה הוה יהא יהוה (ki hu haya, hu hove, yihye: YHVH). And in English: Because He Was, is Present, Will Be. However, the word כ י (ki), because, also connotes that, or who (Fig. 9). So, combining the sentence with the words א ב א גג found in the four upper rows (Fig. 8), we receive this translation for the Kabalistic rendition of Pascal’s Triangle: One Supreme Father, Who exists, existed and will exist: Jehovah. Fig. 9: ‘Who exists, existed and will exist’. The painting in Fig. 1 is presented on two central triangles flanked by four smaller triangles that form a stylized Star of David. The upside down vertex of the ochre Pascal’s Triangle points towards the South Pole, whereas the apex of the black triangle with its Hebrew text points to the North Pole. These two geometric modules form a diamond. The Hebrew text in the painting holds many mysteries. It intrigues with inscrutable enigmas. In the fifth row the word דוד (David) appears (Fig. 10, right). About 3,000 years ago David was the King of Israel who made Jerusalem the religious and political capital of the nation. He is the reputed author of many of the Psalms of the Bible and his name is associated with Judeo-Christian messianic beliefs. Combining the letter gimel of the fourth row with the adjacent equivalent letters of the word David in the fifth row below extends the scope and range of the enigma. It yields the Hebrew word gdud, which connotes military force, battalion or regiment. The context conjures up the Biblical story of David who killed in a duel the giant Philistine Goliath. The First Book of Samuel describes how the future king of Israel confronted the taunting and blasphemous giant warrior in the Valley of Oak, while the armies of Israel and the Philistines braced themselves up for the war. The fair-faced and ruddy young poet- musician, who was inexperienced in battle, armed himself only with a sling and five stones that he selected from a brook. And then approaching the derisive and God-cursing Goliath, David said to the Philistine: ‘I came to you in the name of the Lord of hosts, the God of the Armies of Israel‘ (17:45). The name דָּוִד (David) roots from the Hebrew word דּוֹד (dod), which means uncle, dear friend or beloved. Although the Hebrew noun אהבה (ahava), love, and the adjective אוהב (ohev), loving, can be constructed from the letters of the script in Pascal’s Triangle, the loving disposition of God already follows from his characterization as Father in the third row of the painting. Still, in this regard a puzzling detail of the fifth row in the Hebrew text concerns the problem of interpretation. Since the writing in the painting lacks punctuation marks, the three Hebrew letters, dalet, vav, dalet that constitute the word David, also can be read as dod, beloved. Reading the word this way reaffirms the divine loving essence of God. And the concept of Brotherly Love is a glorious tenet of Judaism. The Torah instructs to treat people with kindness and compassion. Leviticus 19:18 elevates the commandment to a universal principle: ‘Love your neighbor as yourself‘. The New Testament echoes the Hebrew Bible, reiterating several times the commandment of brotherly love. Fig. 10: Messianic symbols: Fish (left) and David (right). Young David who played the harp to soothe the mood swings of Saul, the Psalmist poet and the warrior, became the greatest king of Israel. Reigning from Jerusalem; he united the Hebrew tribes, defeated his enemies and expanded the nation’s borders. Despite David’s trespasses and sins, which he publicly confessed and Psalm 51 records them, religious tradition honors him as the model for the ideal king. The paragon of God’s Messiah, the Bible praises him for his wholehearted love of the Lord. In the prophets’ vision the anointed savior descends from David’s family line and will ultimately rule God’s eternal Kingdom. The word David appears in the fifth row of the Hebrew transposition of Pascal’s Triangle (Fig. 10, right). Reading from the fifth row upwards to the fourth the word ד ג (dag) or fish reveals itself (Fig. 10, left). The fish is a prominent emblem of Christianity. One has to bear in mind though that Christianity is based on Judaism and that Jesus was a Jew. The Jewish custom of eating fish in each Sabbath dinner is a fore- state motif of immortality. It anticipates the Feast of Leviathan, which according to the Talmud will happen when the Messiah comes. The Biblical story of the Prophet Jonah who was swallowed by a huge fish but survived the ordeal to fulfill his mission is a symbol of immortality and resurrection. So in a sense, Jonah is a prototype of Jesus and of eternal life. However, the fish is a universal archetype. In Buddhism it means freedom, happiness and well being. It also seems to play a significant role in Taoism, wherein the Yin-Yang sign is made out of two stylized fish figures. And in Hinduism the fish is portrayed as a metaphor of deliverance and salvation. Appearing as an avatar, the protecting deity Vishnu once manifested himself in the physical body of a fish in order to save mankind from the ancient global deluge. Fig. 11: 'The Womb'. Acrylic on canvas, 20‘x24‘, 1998, Collection of Hanseo University Art Museum, Seoul. 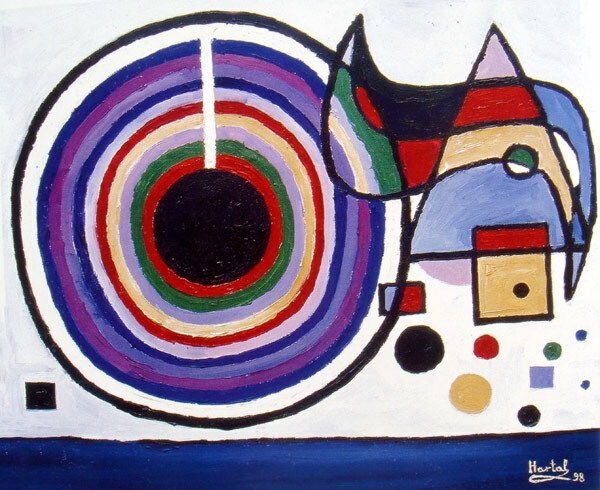 The origin of life in the Womb of Infinity: The painting symbolizes the idea that God created humanity in his own image, imbuing the world with the divine. The rings in the composition allegorize the divine emanations (sephirot). The Hebrew letter heh, with the overarching yod in the right, are part of the Tetragrammaton, the ineffable name of the Lord. Now let me raise the problem of the esoteric communiqué inherent in the Pascal’s Triangle as a chance formation. How certain is it that what we have here is not just a coincidence, that the Hebrew letters shown in the painting are decoded correctly? Well, certainty is a rare commodity. The most exact sphere of human knowledge is mathematics, but as Einstein points out: ‘as far as the propositions of mathematics refer to reality, they are not certain; and as far as they are certain, they do not refer to reality‘ (Ideas and Opinions, fifth Laurel printing, 1981, p.228). From a statistical perspective all events are possible, although the question is how likely are they to happen? Some pundits argue that given enough time even a monkey hitting keys at random on a keyboard eventually could type out the whole set of the Encyclopedia Britannica. So, is the existence of the world a purposeful miracle created by soulful Intelligent Design, or just a purposeless accident of a soulless nature in a meaningless universe? Mind you, unlike in the so called Bible Codes or Torah Codes, in my painting the mystical message has nothing to do with the use of the statistical method of equidistant letter sequences that allegedly contain meaningful word clusters. Here the Hebrew text corresponding to the integers in the first seven rows of the Pascal’s Triangle consists of 30 stationary characters, less than half of what makes up an average line in a book. So in my opinion, the statistical probability for the rise of this meaningful mystical communiqué of religious significance as a chance event, happening by sheer coincidence in this pattern, is next to zero. Another significant attribute of the painting involves its reading that like in arithmetic can go in any direction. The esoteric message rises by combining the separate words revealed in the painting with the embedded contents of adjacent characters, without the application of equal letter spacing or other methods of mathematical manipulation. Intriguingly, the high probability of a transcendental message flowing from the Pascal pattern into Hebrew transcription manifests itself in the original language of the Torah. The pattern does not work in other alphabetical arrangements (e.g., 1=A, 2=B, 3=C, etc) in English, Hungarian or other language. I submitted an article about the discovery and the painting to Rabbi Dr. Albert H. Friedlander of London, co-editor of European Judaism. In a letter dated 15.1.99, Rabbi Friedlander responded: ‘I have read your paper ‘The Transcendental Transformation of Pascal’s Triangle’ with amazement and awareness of its depth ‘. I also shared the information about the discovery with Sylvia A. Herskowitz, Director of the Yeshiva University Museum in New York. In an undated letter she wrote: ‘I found your explication of the Kabalistic dimension of Pascal’s triangle fascinating‘. As mentioned above, the mystical message inherent in the Hebrew rendition of the Pascal Triangle transcends the realm of science. Metaphysical phenomena elude scientific investigation because the latter cannot be applied to the spiritual and the sacred. Nevertheless, I asked Dror Bar-Natan for his opinion on my discovery. A professor of mathematics at the Hebrew University and the University of Toronto, Dr. Bar-Natan is a world-renown expert on the Bible Codes. He maintains that claims concerning intentional coincidences of hidden words or phrases in the Hebrew Bible appearing as letters with equal spacing are nonsensical. His studies, conducted together with Brendan McKay and Shlomo Sternberg, refute the Bible Code experiments on grounds that the hidden messages result mainly from illicit data manipulation. Furthermore, these mathematicians subjected Tolstoy’s War and Peace and other texts to statistical data manipulation and have found hidden messages in them paralleling the Bible Codes. In an e-mail of February 28, 2005, Dr. Bar-Natan says regarding my experiment: ‘I tend not to believe in such codes, they do not seem to be statistically significant‘. Mind you, he does not refute the esoteric Hebrew text embedded in the Pascal pattern. Instead, he gives a ‘religious‘ comment: He does not ‘believe in such codes‘. But as stated above, the Hebrew version of Pascal’s Triangle has nothing to do with equidistant letter sequences or illicit data manipulation. 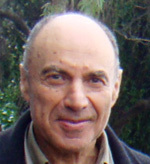 In my view, Prof. Bar-Natan does not want to look into this discovery because, as he himself states on the Web, his professional reputation is harmed by paying attention to mystical experiments conducted by means of statistical methods. My claim for the presence of a deep and mysterious message inherent in the Hebrew rendition of the Pascal Triangle is both irrefutable and unscientific. Due to the basic limits of logic and reason the transcendental experience is closed for scientific exploration. The spiritual spheres of the celestial and the sacred are not amenable to rational inquiry. However, my assertion that this Kabalistic painting displays a built-in mystical code is philosophically analogous to the Platonic vision of mathematics, which holds that mathematical ideas and formulas are not inventions of the mind but are intrinsic to nature and the universe. The Almighty is a mathematician. The Kabalistic interpretation of Pascal’s Triangle transcends the domains of art and mathematics. The deciphered script arising from the encoded arithmetic pattern manifests itself as a verifiable miracle of empirical divine revelation. Paul Hartal, is a Canadian artist, poet and philosopher, born in Hungary. Critically acclaimed author of A History of Architecture, (1973), The Brush and the Compass (1988), and Postmodern Light (2006). Recent exhibitions in Montreal, New York, Seoul and Budapest. © Paul Hartal. Publishing rights © Gil Dekel. Very interesting! One thing that came to mind is that we do not know if numbers were invented before letters or vice versa, because looking it at the other way around it might have been that priests were actually looking into mathematics and arranged the alphabet in such a way that it would reveal a mystical system and thus created a esoteric and exoteric religion to be decoded. We do know that Moses was said to be teached by the pharaos and being slaves it adds to why they might have hidden the real esoteric meaning of their religion. This would incline that religion was born from the discovery of mathematics, and since all you need to create a perfect mathematical and geometric system is two sticks and a rope, this would not be too far fetched: If you can draw perfect circles, you will eventually find all correlating math systems since maths and geometry are incorporated. Thank you so much for sharing this find! I am revisiting my former interests in Kabbalah and need recommendations for good books to study. Would you please tell me the top three you would recommend to a beginning student?